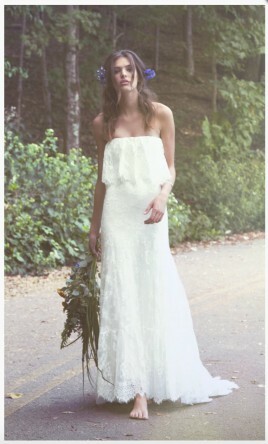 The bohemian "Iver" is a strapless lightweight wedding dress with a flattering fit and flair silhouette. The gown hugs the bodice and releases at the hips, featuring a soft floral lace and beautiful scalloped eyelash trim. Accentuating the waist, the top ruffle is designed to be slightly shorter in the front while gradually longer in the back. Hidden back zip and romantic rounded out train extends from the skirt. Double lining makes dress fall nicely. Style is suitable for many body types. The Iver is designed with airy layers that move effortlessly. Very comfortable to wear. Easy to move and dance in. Easily packs in a suitcase without wrinkling. Perfect for destination weddings, boho style weddings, or a lovely beach / country wedding! Dress comes with sewn-in cups, but can be worn with a regular strapless bra comfortably. Excellent condition. No flaws. Looks like new! I absolutely loved this gown the moment I saw it. It's beautiful, romantic and easy to wear. Feel free to message me for any additional pictures or questions.